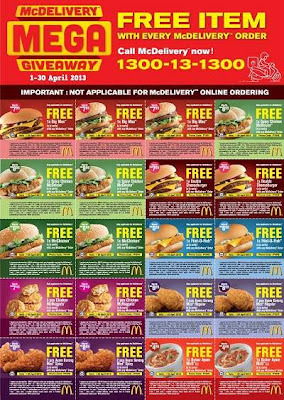 McDelivery Mega Giveaway! 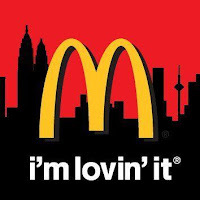 McDonald's is giving away over RM150 worth of FREE items! Choose from 9 different items, and get 1 FREE with every McDelivery order. Choose your favorite item and call 1300-13-1300. Mention the promo code to the call agent when ordering (RM18 minimum order applies). Cut out the coupon and hand it to the rider when food arrives. Don't miss out this MEGA GIVEAWAY! Both colour and black & white print out are accepted. LIKE and SHARE out this great offer to your friends & family ya!